Home World 3 Decades Later - Cheech and Chong Are Back!! 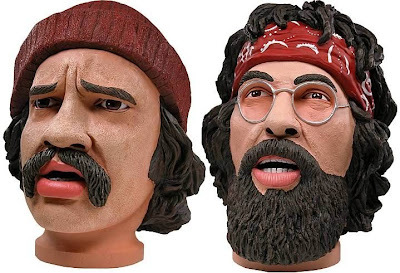 3 Decades Later - Cheech and Chong Are Back!! According to a recent interview with 'Ralph' Magazine, this is a JOINT Effort!! You blokes are touring Australia this month. Have you ever been here before? Cheech: I haven’t been down there in many, many years. I was there in the ’80s — the late ’80s, or the early ’80s. Maybe the mid ’80s? I was filming a movie called The Shrimp on the Barbie [it actually came out in 1990]. Chong: We were there twice to tour, back in the ’70s. Did you try the local pot? Cheech: Nah, they only had hash. It was very good, but it made you hot. Chong: We smoked a bit. I’m actually not a big smoker, so I’m not one of those connoisseurs. I can get high just thinking about it. I’m one of those pussies. I just take a little toke. That’s what I learned to do — I’m a one-hitter. Then I’m good to go. I don’t like getting stoned to the point that I’m throwing up. What’s the biggest joint you’ve ever rolled? Cheech: It was about a foot long. It took about 100 papers. Chong: I rolled a big fattie in Jamaica one time. I just wanted a couple of joints — I was only going to be there a few days with my family. So I sent out the word and this Rasta man bought me an armful — literally. It looked like he was carrying wood. Then I took these big papers and glued them together. It was about the size of a cucumber, and it was rolled perfect. The secret is no seeds, nothing in there, just the pure powder. So I rolled it up and we went fishing. That was the biggest joint ever. What’s the best food when you’ve got the munchies? Chong: Any food. You’ll eat dog food if you’re stoned enough. Have you ever been so high you saw God? Chong: Yeah. I’ve had some real good times with God. God and I get along great. He shows me things. Cheech: I see her every night. She’s very hot. What was the deal when you blokes split up? Cheech: We just got tired of each other. We’d been together 24/7 for 17 years. 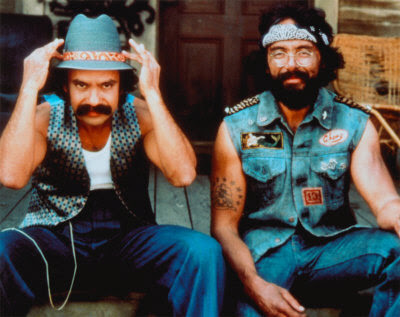 Chong: We became movie stars, and Cheech got tired of being seen as the dumb Chicano. He wanted to change the direction of the group, and I didn’t. Cheech was tired of being told what to do, and I was tired of dragging him kicking and screaming through projects. So he went off and did his thing, and I did mine. How was getting back together again? Cheech: That was easy. Friends just come back into your life. It was all good. It was like we’d been away for 30 seconds, not 30 years. What do you reckon your FBI file says about you? Chong: It’s pretty thin. They did a big check on me and found I hadn’t done anything wrong for, like, 66 years. I was clean as a whistle.